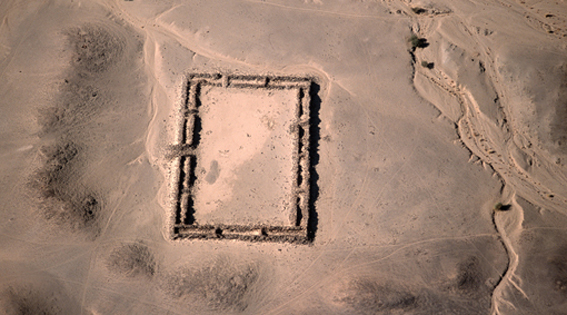 Quweib is a rectangular structure, measuring 50 by 80 m. A series of 16 rooms form a rectangular enclosure around an open courtyard with a platform located on its west wall. The function of the platform, which seems to be massive and made of boulders is not yet known. The sole entrance is on the east side. The method of construction, the many windows, and the arrangement of the rooms is very reminiscent of Umm Ruweim 1; in fact, Quweib represents a simplified version of Umm Ruweim 1. Geophysical methodology did not identify any structures inside the enclosure, suggesting that the courtyard was empty. The many windows in the exterior wall, which are located 1 – 1.5 m. above ground level, not only provide light and ventilation but also an opportunity for viewing the surrounding terrain. Since the windows that opened onto the courtyard are set 2 m. higher, peering into the courtyard from outside the enclosure would have been well nigh impossible, so that we may presume, for the time being at least, that a glimpse of activities in the courtyard – such as, for example, ceremonies – by those outside was unwelcome.